The book"The Children of Craig-y-nos", tracing forty years of lost history of this childrens sanatorium in the Swansea Valley is now published and available from Waterstones or Amazon.co.uk. But stories are still coming in which I am using on this blog. My name is Ann Shaw ( nee Rumsey) and I was patient at Craig-y-nos from 1950-54 in Ward 2. Do you have a story to tell? Email:annshaw@mac.com or ring: 01786 832287. 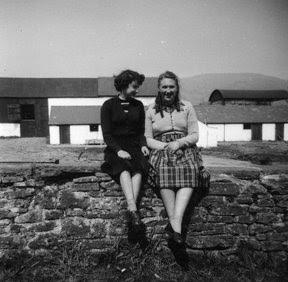 Ann Shaw ( nee Rumsey) (left) and Mari Friend( nee Jenkins) at Ty-Llangenny farm. After I left Craig-y-nos Mari used to come with her parents to visit and often she would stay on the farm. Free download of "Children of Craig-y-nos"
Book "The Children of Craig-y-nos"
Craig-y-nos - 2 nights as Christmas present!